This Thursday, I held a conference talk at the 24th International Symposium on Biodiversity and Evolutionary Biology of the German Botanical Society. 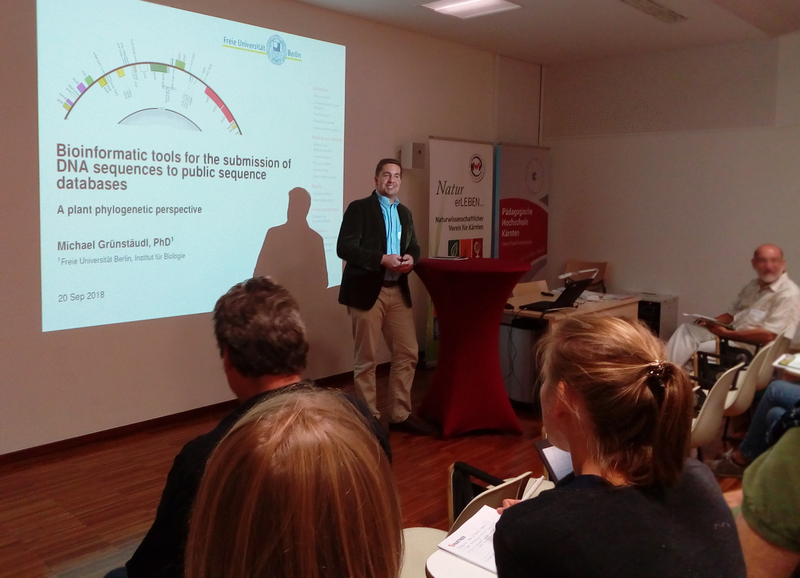 I introduced the participants to some of my newly developed tools for streamlining and automating the submssion of plant DNA barcoding sequences to public sequence repositories. This conference was a wonderful example of how small conferences can both meet high scientific standards and be an enjoyable reprieve for the participants. Lots of interested talks and a great social programme among the gorgeous Carinthian scenery! Der Beitrag wurde am Sonntag, den 23. September 2018 um 12:00 Uhr von Michael Grünstäudl veröffentlicht und wurde unter Allgemein abgelegt. Sie können die Kommentare zu diesem Eintrag durch den RSS 2.0 Feed verfolgen. Sie können einen Kommentar schreiben, oder einen Trackback auf Ihrer Seite einrichten.